Every autumn I hear the soft tweeting of migrating American Goldfinches as they arrive and gather by the dozens in the branches of my mature live and scrub oak trees. Eventually they make their way down to eye level at the bird feeders. They are extremely people-shy, flitting away at the sight of me and my camera. Until recent years, I put out thistle feeders just for them. A strange turn of events occurred a couple of years ago. For some reason they weren't choosing thistle to eat. 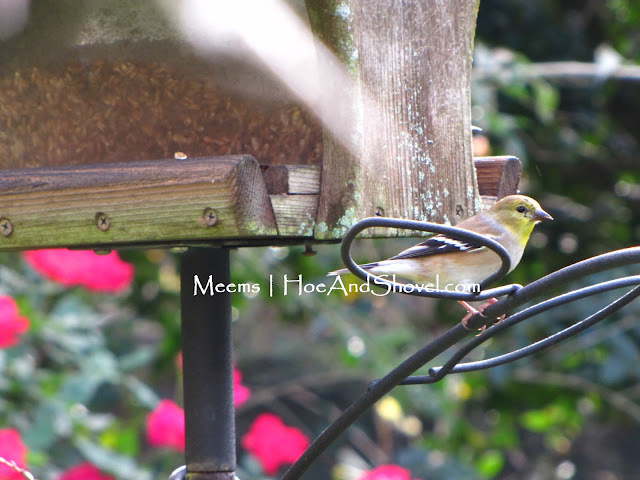 Instead, they were frequenting the bird feeders with mixed sunflowers and the safflower-only feeders. When I asked the owner at Wild Birds Unlimited if he noticed the same pattern of Goldfinches skipping over the thistle, he confirmed my observations. He noted there wasn't a clear reason for this change in the Goldfinches' habits. Now I don't bother with thistle during the winter months while Goldfinches are visiting. Here is a link to a YouTube video of the Goldfinches in my garden in Spring 2011. 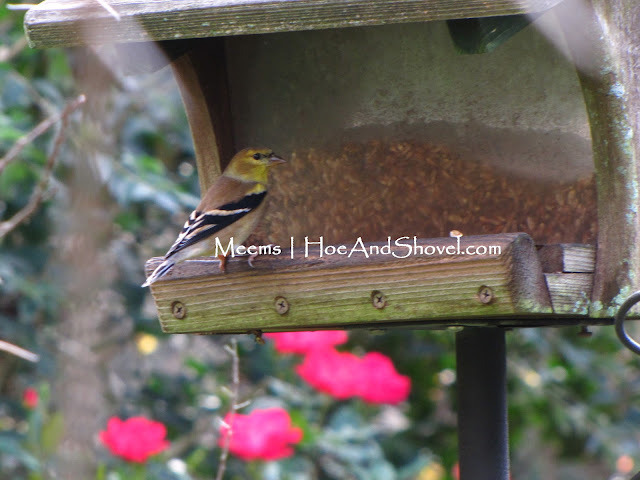 *** Hoe and Shovel on Facebook *** come see the daily plants/flowers photos and lively discussions. Click on the LIKE button under the header to be part of the conversation. Would love to hear what's going on in your garden. Aren't they lovely? What a treat to see them in your garden. We have more birds now too, but haven't seen any gold finches yet. You are so lucky. I have seen goldfinches eating seed pods from my elm trees, but never at my feeders. They are so lovely, even in their paler winter attire. I haven't seen any at my feeder here in Umatilla since moving here a year ago. We had them in Georgia in abundance. Certainly loved watching them at the feeder as they dropped from tall tree branches down to eat. They looked like little lemon drops raining down when they were in their full yellow plumage. I can see them in this picture but a hawk keeps circling my back yard so it's keeping my birds away. Now if only the squirrels would follow suit. They love to eat the crushed acorns on my driveway and if I stand still, will almost eat right next to me. Wow, great pictures! And very interesting about the thistle seed. I'm going to have to tell my husband--he's always puzzling over the goldfinches and their finicky ways. Ah, so that's where my little friends the goldfinches went to! We see some many of them in summer, and I do miss that bright yellow spot in the winter. Just saw some today at my tube and house feeders! T & C area of Tampa. Great birds, love the summer colors! We have at least a hundred here in quincy fl. They are hungry things. I'm kinda looking forward to their migration.